The only person, in history, to win all three road discipline Nationals championships in one year (2014), Alison is the owner and head coach of ALP Cycles Coaching. She has been coaching cyclists for 9 years. Thanks to her background as both a national level ski racer and bike racer, she brings an unparalleled knowledge and skill base to cycling. A USA Cycling Level 2 certified coach, and TrainingPeaks Level 1 certification and is certified as both a Road and CX racing coach from USAC. Alison is the only person, in history, to win all three road discipline National Championships in one year (2014). These three national championships go along with 2 previous national championships (Time Trial 2008, Team Pursuit 2008), 2 National Racing Calendar titles, and a 2nd place at the Leadville 100 mountain bike race (2013, 7:26hrs). 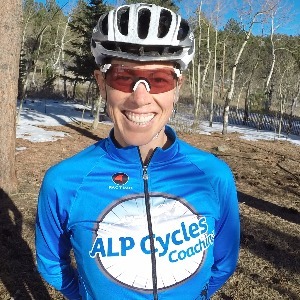 Alison is owner and head coach of ALP Cycles Coaching, and ALP Cycles Racing (a women's race team in Colorado). She has been coaching cyclists for 9 years. Alison brings an unparalleled knowledge and skill base to cycling and bike racing. After 7 years on the US Ski Team as a downhill ski racer, Alison raced bikes professionally for 8 years. She is a USA Cycling Level 2 certified coach, has a TrainingPeaks Level 1 certification, and is certified as both a Road and Cyclocross racing coach from USA Cycling. Alison specializes in road, cyclocross, and mountain bike skills clinics, and high performance race preparation and tactics. Success. Coach Alison Powers has been notified of your message. ALP Cycles Coaching- Road Racing-8 weeks-Final prep for race season.